Dirt Treaders Mountain Biking Community • View topic - Living to ride! Lurking no more! Living to ride! Lurking no more! Post subject: Living to ride! Lurking no more! My name's Nolan - Copper Cable on here. I've been lurking around, but I'm finally stopping to take a few pictures on my rides and thought I'd share a few. And also thought I'd introduce myself. I'm about to turn 50. Is that too late for a mid-life crisis? I ride a Cannondale F400 I purchased ten years ago? Maybe More? I've upgraded a lot since then - bars, grips, seat, pedals, disk brakes, tires, etc., and I need to replace the cassette sometime in the next few weeks. I regularly beat the heck out of my 80mm travel Headshok, but having a hardtail is improving my skills. At least that's what I tell myself as I bump down Nobel Canyon or navigate rocks on the trails in St. George. But I have my eye on a new 2018 Commencal Meta TR 4.2 bike, and so pretty soon I'll be picking myself up one of those. Almost have enough saved! I live up in Ramona, and I ride 2-3 times a week on the trails around the San Diego Country Estates, and every other weekend or so I try to ride something bigger, like the Big Laguna Trail or Pamo Valley or something. Twice a year I meet up with my in-laws and we ride Northern California and St. George trails for a week each. Awesome! Wave "hello!" as you pass me sometime! Post subject: Re: Living to ride! Lurking no more! Welcome to Dirt Treaders, and thanks for the intro. It is never too late for a midlife crisis, or for a new bike. Only 50? That's good - you will still be riding when those new USFS trails get built in Ramona. And yes, I will wave, as you pass me. Welcome. What would be the smoothest and least elevation gain Trail in St George? Welcome aboard Nolan. It's never too late, if you're breathing and pedaling. Welcome... I'm still off my bike for a bit, but I live in Ryland. Would love to learn the estates trails.. I'm pretty excited about those new trails. I've ridden the truck trails in Pamo Valley, and the potential for some really great stuff up there is huge. When proposed maps come out, I'll definitely be looking them over, and volunteering to do some trail building. They can't come soon enough. So many of the trails in St. George involve climbing or rocks. But there are a few that are pretty smooth. 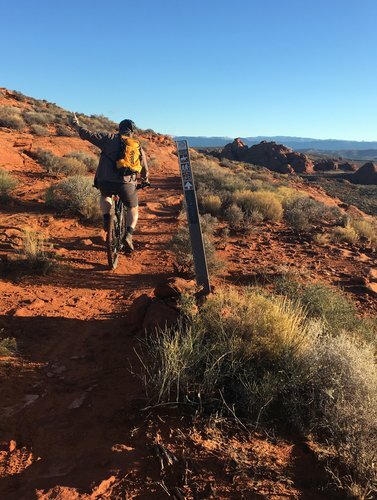 Some trails around Snow Canyon are pretty flat - some are paved, even - that would be fun for a beginner because the view is awesome even if the trail is not challenging. The Jem trail system is relatively smooth for the St. George area, but there are some technical areas here and there and it require some gradual climbing if you start on the northern side. Love the trails there. Also there's a greenbelt along the Virgin River, if I'm right! Welcome, Nolan, or CC as I'll likely slip to calling you. As a Certified Senior Citizen, the midlife crisis thing is often not so much about the time of life, but about examining the life one's lived. A lot of us kind of avoid that a long as we can. Anyways, you live in proximity to some fine trails, and if Pamo Valley opens up you'll have even more. Here's to meeting you on the trail someday!